The Romani (an aa spelled Romany), or Roma, are a tradeetionally nomadic ethnic group, leevin maistly in Europe an the Americas an oreeginatin frae the northren regions o the Indie subcontinent, presumably frae whaur the states Rajasthan, Haryana, an Punjab exeest the day. Thay are an aa kent as Gipsies. ↑ Lewis, M. Paul, ed. (2009). "Ethnologue: Languages of the World" (online) (16th ed.). Dallas, TX: SIL. Retrieved 15 September 2010. Ian Hancock's 1987 estimate for 'all Gypsies in the world' was 6 to 11 million. ↑ "The Roma". Nationalia. Retrieved 20 November 2015. ↑ "Rom". Encyclopædia Britannica. Retrieved 15 September 2010. ... estimates of the total world Romani population range from two million to five million. ↑ "The Marginalization of Shadow Minorities (Roma) and Its Impact on Opportunities". Books.google.com. p. 117. Retrieved 2016-07-27. ↑ "Falta de políticas públicas para ciganos é desafio para o governo" [Lack of public policy for Romani is a challenge for the administration] (in Portuguese). R7. 2011. Retrieved 22 January 2012. The Special Secretariat for the Promotion of Racial Equality estimates the number of "ciganos" (Romanis) in Brazil at 800,000 (2011). The 2010 IBGE Brazilian National Census encountered gypsy camps in 291 of Brazil's 5,565 municipalities. ↑ "Türkiye'deki Çingene nüfusu tam bilinmiyor. 2, hatta 5 milyon gibi rakamlar dolaşıyor Çingenelerin arasında". Hurriyet (in Turkis). TR. 8 May 2005. Retrieved 2 January 2016. ↑ "The Situation of Roma in Spain" (PDF). Open Society Institute. 2002. Archived frae the oreeginal (PDF) on 1 December 2007. Retrieved 15 September 2010. The Spanish government estimates the number of Gitanos at a maximum of 650,000. ↑ "DiagnÃ³stico social de la comunidad gitana en EspaÃ±a" (PDF). Msc.es. Retrieved 2016-07-27. ↑ 2011 census data, based on table 7 Population by ethnicity, gives a total of 621,573 Roma in Romania. This figure is disputed by other sources, because at the local level, many Roma declare a different ethnicity (mostly Romanian, but also Hungarian in Transylvania and Turkish in Dobruja). Many are not recorded at all, since they do not have ID cards . International sources give higher figures than the official census(UNDP's Regional Bureau for Europe, World Bank, International Association for Official Statistics). ↑ "Situation of Roma in France at crisis proportions". EurActiv Network. 7 December 2005. Retrieved 21 October 2015. According to the report, the settled Gypsy population in France is officially estimated at around 500,000, although other estimates say that the actual figure is much closer to 1.2 million. ↑ Gorce, Bernard (22 July 2010). "Roms, gens du voyage, deux réalités différentes". La Croix. Retrieved 21 October 2016. [MANUAL TRANS.] The ban prevents statistics on ethnicity to give a precise figure of French Roma, but we often quote the number 350,000. For travellers, the administration counted 160,000 circulation titles in 2006 issued to people aged 16 to 80 years. Among the travellers, some have chosen to buy a family plot where they dock their caravans around a local section (authorized since the Besson Act of 1990). ↑ rs:Национална Припадност Припаднос [National origin affiliation] (PDF) (in Serbie). RS: Stat. 29 November 2012. Retrieved 2 January 2016. ↑ "Serbia- a report by the European Roma Rights Centre" (PDF). ERRC. 2011–2012. Retrieved 30 September 2016. ↑ "Population and Housing Census. 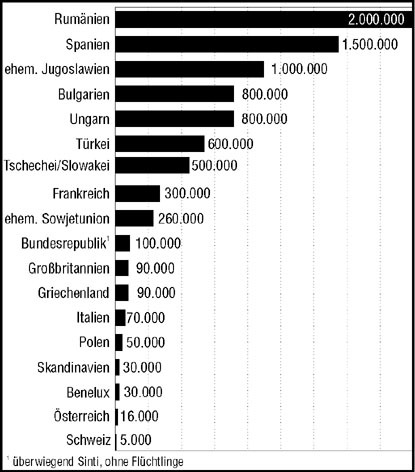 Resident population by nationality" (PDF). SK: Statistics. Archived frae the oreeginal (PDF) on 15 July 2007. ↑ "Po deviatich rokoch spočítali Rómov, na Slovensku ich žije viac ako 400-tisíc". SME (in Slovak). SK: SITA. 25 September 2013. Retrieved 25 September 2013. ↑ "The 2002-census reported 53,879 Roma and 3,843 'Egyptians'". Republic of Macedonia, State Statistical Office. Archived frae the oreeginal on 2004-06-21. Retrieved 2010-09-17. ↑ Hazel Marsh. "The Roma Gypsies of Colombia". Latino Life. Retrieved 29 July 2016. ↑ "Poland – Gypsies". Country studies. US. Retrieved 28 August 2015. ↑ "POPULATION BY ETHNICITY – DETAILED CLASSIFICATION, 2011 CENSUS". Croatian Bureau of Statistics. Retrieved 21 June 2015. ↑ "Albanian census 2011" (XLS). instat.gov.al. Retrieved 7 December 2015. ↑ "Roma in Canada fact sheet" (PDF). home.cogeco.ca. Archived frae the oreeginal (PDF) on 2007-06-14. ↑ Yvonne Slee. "A History of Australian Romanies, now and then". Now and Then. Australia: Open ABC. Retrieved 28 July 2016. ↑ Emilio Godoy (12 October 2010). "Gypsies, or How to Be Invisible in Mexico". Inter Press Service. Retrieved 30 July 2016. ↑ Hazel Marsh. "The Roma Gypsies of Colombia". Latino Life. Retrieved 30 July 2016. ↑ unknown. "Culture of Slovenia". Retrieved 28 July 2016. ↑ Emmanuel Haddad (21 March 2012). "Kirtimai:Lithuania's Roma on education and 'missing England'". Cafebabel. Retrieved 29 July 2016. ↑ 53.0 53.1 K. Meira Goldberg; Ninotchka Devorah Bennahum; Michelle Heffner Hayes (2015). Flamenco on the Global Stage: Historical, Critical and Theoretical Perspectives. McFarland. p. 50. ISBN 978-0-7864-9470-5. Retrieved 8 December 2015. ↑ 54.0 54.1 Simon Broughton; Mark Ellingham; Richard Trillo (1999). World Music: Africa, Europe and the Middle East. Rough Guides. p. 147. ISBN 978-1-85828-635-8. Retrieved 8 December 2015.